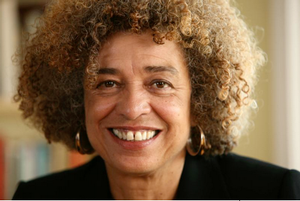 Angela Y. Davis, feminist scholar activist for social justice and professor emerita at U.C. Santa Cruz, was honored at the annual Sackler Center First Awards at an awards ceremony and dinner reception at the Brooklyn Museum on June 2, 2016. In a show of solidarity with Davis's principles and in response to the Sackler Center's call for social action, like-minded people from across creative disciplines are joining forces as "Artists in Support of Social Action," a group composed of Marina Abramović, Ida Applebroog, Harry Belafonte, Dara Birnbaum, Tony Bennett, Judy Collins, Petah Coyne, Kasseem Dean (aka "Swizz Beatz"), Jane Fonda, Coco Fusco, Alan Gilbert, Guerrilla Girls, Harmony Hammond, Tony Kushner, Suzanne Lacy, Debra Lee, Shola Lynch, Wynton Marsalis, Audra McDonald, Marilyn Minter, Toni Morrison, Shirin Neshat, Jessye Norman, Lorraine O'Grady, Yoko Ono, Suzan-Lori Parks, Faith Ringgold, Carolee Schneemann, Joan Semmel, Cindy Sherman, Charles Simonds, Kiki Smith, Joan Snyder, Susan Stroman, Susan L. Taylor, Julie Taymor, Mickalene Thomas, Fred Tomaselli, Kathleen Turner, Kara Walker, Carrie Mae Weems, Ray Charles White, Martha Wilson, and Damian Woetzel. The annual Sackler Center First Awards celebrates women who have broken gender barriers and made remarkable contributions in their fields. The 2016 award will be presented to Davis by Brooklyn Museum board chair and founder of the awards, Elizabeth A. Sackler. In addition to her achievement as an activist and scholar, Davis' honor at a visual arts museum is a reminder of her high visual profile. She is the subject of much photography and has inspired numerous works by visual artists, including Wardsworth Jarrell whose Revolutionary (Angela Davis) is in the Brooklyn Museum's collection and was on view in Revolution! 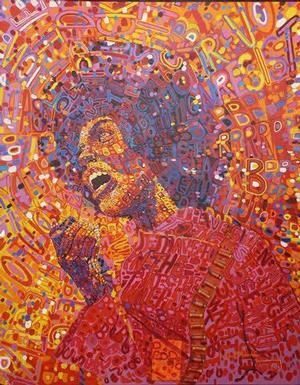 Works from the Black Arts Movement (February 5, 2014 - May 3, 2015). Barkley Hendricks painted Lawdy Mama in 1969 — the year when Davis first attracted national news coverage, as a result of being fired from UCLA. If Hendricks' subject is not specifically Angela Davis, it's a tribute to her type. Angela Davis discusses the visual iconography about her self and her own experience of that imagery in “Afro Images: Politics, Fashion and Nostalgia" in the Names We Call Home anthology (1996). In the essay, Davis draws from the ideas of photography critics and visual culture theorists such as John Berger, Roland Barthes and Susan Sontag to discuss how her image became a generic construct and was commodified. *From the editor's interview with Samella Lewis for the article, “Samella Lewis: An Institution in Her Own Right” in IRAAA, vol. 18, no. 1, 2001.